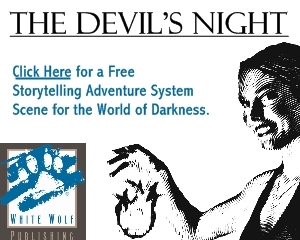 The amount of source material produced for the World of Darkness role playing universe is truly impressive. Not all of it is useful to players – much of it being useful primarily to the game master for the purposes of fueling any individual group’s adventures – and some is of benefit to all players. 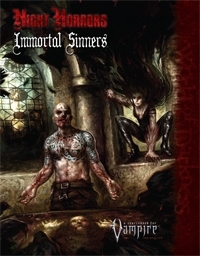 Night Horrors: Immortal Sinners is a book that is fascinating to read for any aficionado of the setting, but is likely best left to the GMs (or “Storytellers” in White Wolf’s World of Darkness parlance) as it spends most of its 160 pages detailing powerful vampires that the players’ characters could bump into in-game. The personalities detailed here run the gamut of vampire experience. 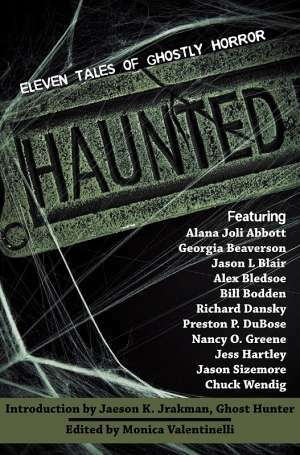 The book leads off with Solomon Birch, a notable in the Chicago area and leader of the local chapter of the Lancea Sanctum – vampires who believe they are God’s instruments, intended to torment humans in order to keep them on the straight and narrow. Birch is powerful and mean, but like most vampires he takes the long view; his plots and schemes take years to fully bear their tainted fruit. There are many surprises to be found in this book. Some of the creatures within can pass for human; some are truly monstrous, their only real connection to the humanity they left behind ages ago is, perhaps, language and material goods. Their habits, their attitudes, their very thought processes are now so totally alien to humanity as to represent something entirely different. The final example in the book, The Unholy, is a creature out of a vampire’s worst nightmare. Terrifyingly fast even by a vampire’s standards, she is so ancient that mere human blood is no longer sufficient to sustain her – she requires the blood of vampires to keep her moving. She also has a nasty quirk that frightens vampires more than anything else; her regular habit of diablerizing other vampires; that is, draining them of their blood and consuming their very soul as well. She can occasionally be bargained with – as the running flavor text throughout the book artfully demonstrates – but in the end she will have her prey, come hell or high water. Night Horrors: Immortal Sinners is part of a series of Night Horrors volumes, including Wicked Dead (also for Vampire: The Requiem); Grim Fears for Changeling: The Lost; The Unbidden for Mage: The Awakening and Wolfsbane for Werewolf: The Forsaken. Each is usable with any of the World of Darkness setting books, but the creatures presented within are most highly recommended as encounters for their primary setting by virtue of meshing more easily within that world. At the same time, it could be a dazzling conundrum for vampires to tangle with some ancient Fey creature, or for werewolves to have to come to grips with a coven of mages or an immensely powerful lone sorcerer; the possibilities are many, and hopefully inspiring. Reading Night Horrors” Immortal Sinners is an intoxicating journey, drawing in the Storyteller and suggesting numerous plot hooks and storylines for years worth of game nights. Its relatively low rating is only because of its limited usefulness – intended for Storytellers rather than all players. Regardless, it’s an excellent read for any fan of vampires and the World of Darkness settings, and is a worthy addition to any bookshelf. Players, check with your Storyteller before reading about these nasties… you wouldn’t want to spoil the surprise, would you?